The workings of an engine are clearly explained through observing this representation four stroke petrol engine. The operation of the valves is clearly evident with the cams being driven by a gear train from the rear of the main crank. A simulated spark plug uses a small lamp to indicate the firing point and a cross section of the carburetor is shown. 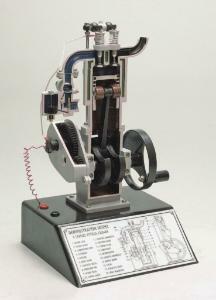 Mounted on a base, the engine provides screw terminals for connection to a 3V battery.